It itches as I write this, my new tattoo, first tattoo. Black barbed wire wrapped tight around my right biceps and triceps, a desire which took decades to distill. Four times a day I dutifully rub lotion on it, study the design in the mirror, watch it peel and heal, try to discern its history. West Virginia University Press has just released a collection of West Virginia writing, edited by Laura Long and Doug Van Gundy, called Eyes Glowing at the Edge of the Woods: Fiction and Poetry from West Virginia. We are pleased to report that it contains the title story from Jeff’s first volume of short fiction, A History of Barbed Wire. Thanks to the editors, Laura Long and Doug Van Gundy, for including Jeff. 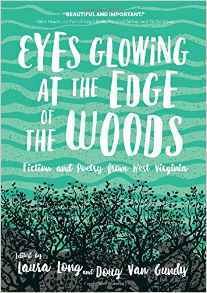 Eyes Glowing at the Edge of the Woods: Fiction and Poetry from West Virginia is now available from fine booksellers, including Amazon.com. Also, A History of Barbed Wire is also available at Lethe Press.